The meeting SLEC for techno-economic vetting of DPRs on January 21. Image: Northeast Now. The State-level empowered committee (SLEC) for techno-economic vetting of detailed project reports (DPRs) on Tuesday vetted 17 infrastructure projects with a total cost of Rs 342.38 crore. All these projects have been approved under the North East Special Infrastructure Development Scheme (NESIDS). The SLEC meeting was held under the chairmanship of Chief Secretary Satya Gopal. Gopal while taking stock of the DPRs under NESIDS 2018-19 in a presentation made by Dr Atop Lego, the chairman of the Technical Board of NESIDS, said that the board and the implementing departments would have to strictly adhere to the guidelines prescribed by the Ministry of Development of North Eastern Region (DoNER) and State government in letter and spirit. 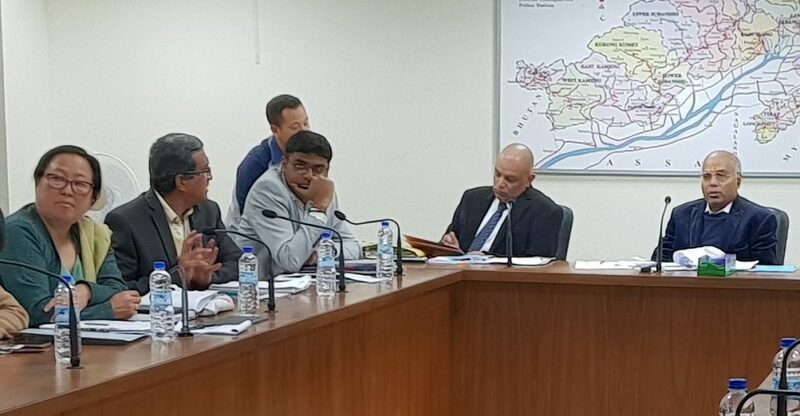 Referring to a DPR of road construction from Longkhow to Pumao Circle headquarters in Longding district, the Chief Secretary asked the engineers to venture into innovative technology while not compromising on quality and considering the financial component. “Nanotechnology in road construction is said to be of great energy savings, faster schedule, better quality, reduced costs, and easy maintenance,” he said. Stressing on value for money, he asked the engineers to adopt feasible and better technology which will bring out a durable infrastructure. In order to have a complete transparency, the chief secretary impressed upon the DoNER Ministry to conduct a third-party monitoring committee which will inspect and verify the quality of the projects. The 17 projects comprising road construction, school infrastructure development, and water supply were vetted in the SLEC which will be placed before the Inter-Ministerial Committee on NESIDS. Some of the important projects are augmentation of water supply in Aalo, Hapoli, Bhalukpong, and Miao Township. Construction of rigid pavement in Tawang Township, CC pavement in Likabali Township, construction of road from BRTF road to Pidi Circle headquarters, construction of road from Likwa Gyadi to Gyawepurang headquarters, etc., were some road projects approved by SLEC. Infrastructure development for Government Higher Secondary School at Kanubari in Longding district, and infrastructure development of Sainik School at Niglok in East Siang district were some important projects taken up during the meeting.